Breathe cleaner air day in, day out. Low humidity can be a problem for many people. Ever noticed how, during winter, you and your family just cannot seem to shake that cold the kids brought home from school? With winter comes low humidity – the dry air that creeps into your house draws in moisture from the air you breathe, drying out your skin, nose, eyes and throat. As you can imagine, this can increase the symptoms of colds and flu; using a humidifier can help you prevent these symptoms by adding moisture into the air, especially in those cold winter months. So why doesn’t everyone have one? Historically, humidifiers have been noisy, big and quite frankly – ugly. The Beurer LB 88 has changed all that; it is stylish, compact and extremely quiet, so you can still use your humidifier at night to ensure you’re breathing in pure, clean air whilst you sleep. Ideal for a baby or toddler’s room to ensure the humidity levels are perfect every night. For 95 years, Beurer have globally distributed exceptional tools that are of high quality design, products that are guaranteed to make you look and feel at your best. This is why they are celebrated as the European one-stop specialist for health and well-being. The stylish Beurer LB 88 is compact, powerful and mercifully silent in running and can be used for any room up to 48m², with a humidification output up to 550ml/h – means nothing to most of us but trust us, we are impressed! 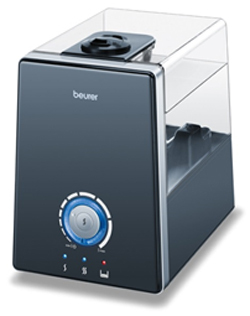 It has a removable 6ltr tank, which is transparent so you can keep an eye on the water level with ease – but don’t worry, if you don’t notice the water running low the humidifier is clever enough to turn itself off – no damage, no fuss. If you have hard water, there is an optional water filter available. Using hard water in a humidifier can be unhealthy; hard water has elevated mineral content, so when released into the air it can solidify into white dust. Using a humidifier that has a water filter can trap the minerals before they become airborne. Not only does the filter benefit you, it maintains the high quality of the unit reducing the risk of lime scale along with thorough cleaning. The Beurer LB 88 dual-technology provides ultrasonic nebulisers with water vaporisation, producing high humidity by ultrasonic humidification technology and a clean, fragrance-free with no bacteria water vaporiser. Clean air naturally - now that is a breath of fresh air! With the Beurer LB88, 15 'blank' aroma pads are included. Just simply place a few drops of your favourite water soluble, fragrant oil onto the aroma pad and slot it into the aroma compartment and allow the LB88 to gently permeate your favourite scent to erase any harsh smells around your home. Don't forget too that using the LB88 is so much safer than using an oil burner - one there is no naked flame as a possible fire hazard, and two, when an essential oil is heated it changes its natural composition - some feel this may be harmful. Using natural aromatherapy oils can be beneficial for people who suffer from depression as certain oils have properties that can aid in having a better night’s sleep, stress relief and certain oils can even help in boosting your memory! You also get 15 anti calcification pads which will protect your humidifier from calcification that could accumulate if you live in a hard water area and a cleaning brush for easy care. Beurer’s LB88 is the ideal humidifier for any room, giving you and your family the purest air possible. Includes 15 anti calcification pads to protect unit in hard water areas.